I had been waiting for a second season and even thought we might not get one which is why I decided to pick up the manga. I ended up loving it, and because of that the second season actually made me quite happy, as it seems to follow almost 1 to 1 with the manga. That is, till we reached the final episode. In all honesty, it was the very episode I had been most eagerly awaiting. For that reason alone, the choices they made had me even angrier. Sadly, they chose to deviate from the manga. In some cases I get why you would do that but in this? I can't say I do. The very core of the manga and this show is Abeno and Ashiya's relationship. It's the bearing pillar, and it's what makes this story so incredibly endearing. One of the changes they made in the final episode was not in any way to the benefit of that relationship. They also changed what has later become a plot point in the story and made someone out to be evil who was not intended to be so. Sasa, the yokai, was orignally the one to make Ashiya try and strangle Abeno and Sakae only killed the yokai because he wanted to keep Ashiya from killing Abeno. Sakae did not try to kill Abeno and he did not kill the yokai out of hate (primarily). Ashiya's strong relation with Abeno was also the reason that Sakae awoke in the first place, as he was fghting against the will to kill Abeno. I believe this was an important part of the story and rather than make Sakae out to be a psychopathic yokai slaying serial killer, the original plot should've been kept intact. I guess the yokai's death was too dark for this otherwise lighthearted show. Since I loved the first season and most of the second season, I will still give it 3 stars. I would've given it 5 had it stuck to the premise of the manga, but alas, it was not meant to be. The second season was okay. I really enjoyed the first season (got me to read the manga) and was super excited when I heard there was going to be a second season! 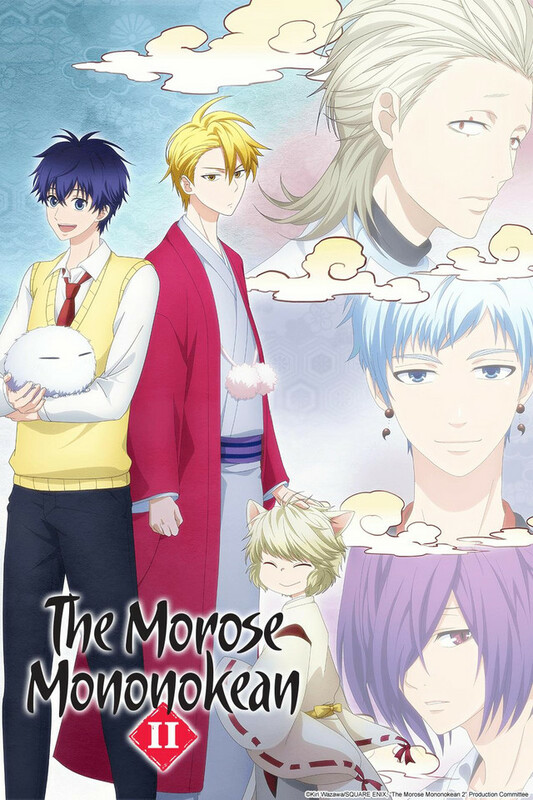 This is a lighthearted fantasy/supernatural anime that is fun to watch if you have some time. The characters are cute and likable. They aren't the most unique though. Ashiya as a main character is pretty basic in character. I still like him though! Although I like this anime, it is not amazing. Nothing really stands out and makes me look forward to next week's episode. Sometimes it feels a little slow? The anime almost gives me slice-of-life feels. Therefore, it can feel a little boring if you are looking for some exciting action. Still a cute anime though if you want some feel-good sweet anime. I've been a huge fan of this anime and it's manga for a long time. I've caught up in the manga but the anime is nice to watch all of the things come together. There is a huge focus on friendship and making people happy so be ready for the feels and the smiles. Hanae and Itsuki are a hilarious team together and I love how their characters grow and compliment each other. This anime is seriously a 10/10! I originally let this anime play for my birds, but ended up being captivated by it, thus watching it together. It is super cute and oh my, so many muffins! I recommend this anime and manga for first timers and those who just want to immerse themselves. I started watching this show when I was having a bad day. It's lighthearted and easy to follow. The colors make everything seem more fun. It was delightful to binge and helped me feel better, so I think it's worth a watch. It's not imperative that you watch it very quickly but if you find yourself wanting to smile or relax, this would be a great place to start. So this series isn't much different from some of the other fantasy/adventure exorcism animes that you've probably watched. But that isn't a bad thing. While a lot of the plot and characters feel familiar it still is a different story and definitely makes you feel good. Loved it. I love this, and would definitely watch again. The concept itself has been used numerous times. Youkai, contractor working to help protect peace between the worlds, etc etc. This was not the best display of this type of story, but it was still quite good and heartwarming. I would recommend this anime positively. The characters have a charm to them that doesn't always come across with youkai. They develop in an interesting way once you get to know more about them. The art style is absolutely gorgeous. I am not really sure why this anime grabbed my attention so much, it just charmed me. I absolutely loved this series! It's so cute, and I really wonna see where it goes especially in terms of Ashiya's 'powers'. It's a shame there isn't many episodes. I can't wait for more to come out. Ashiya is just so cute! He's honestly adorable. At first, I thought this might be another anime where I really dislike the main character but he turns out to be a needed necessity. The story line never took a sharply misguided turn and every character became someone or thing you wanted to see again. Overall I really loved this anime and can see myself revisiting it a few more times. p.s. Also would not mind a continuation.